More than 20 years after NASA put the first man on the moon, NASA began to prepare for future missions into deep space by growing their own fruit and vegetables in space. They had to find a way to reduce ethylene gas which was destroying the plants and vegetables when they would ripen. NASA developed an ethylene scrub air purification machine using a titanium dioxide catalyst in conjunction with UV lamps to remove the ethylene gas. Subsequent tests revealed that this PCO/TiO2 technology also helped destroy harmful organisms such as bacteria that passed through the system. Air Oasis has significantly enhanced this early NASA technology to develop a line of air purifiers. Every Air Oasis air purifier contains a PCO Cell coated with their proprietary nano Nickel HCT catalyst that is permanently bonded to the PCO cell structure. When photons from the germicidal UVC lamp excite water and oxygen molecules on the catalyst surface, redundant oxidizers, including hydroperoxides, super oxide ions, negative ions and hydroxyl ions are formed and are propelled into the air. Organic compounds that collide with the catalyst inside the unit are greatly reduced, also. AHPCO is an Advanced Hydrated Photocatalytic Oxidation technology. Basically, it is a broad-spectrum high-intensity UV light targeted on a patent-pending five-metal catalyst in a low-level ozone and moist atmosphere. This creates an advanced oxidation of friendly oxidizers. 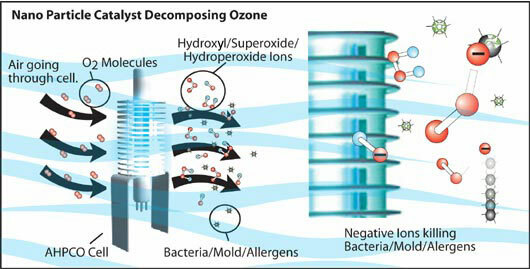 Unlike ozone, these oxidizers are safe (your body creates these same oxidizers), yet aggressive at killing mold, bacteria, viruses, pollen and more. They also effectively neutralize odors, chemicals and VOCs. Once they have done their job they revert back to oxygen, hydrogen and carbon dioxide. AHPCO technology has been successfully used in water, air, food and laundry applications for over a decade. Air Oasis air purifiers utilize true nano technology in their patented nano Nickel HCT catalyst. Many UV air purifiers claim they have nano technology simply because UV light rays are measured in nano meters. Beware of false claims and imitators. The Air Oasis air purifier technology converts ozone into five ions: hydroxyl, hydro peroxide, super oxide, ozonide and negative ions. By utilizing redundant oxidizers you receive greater benefits than that of ozone alone, without the harmful side effects of an ozone air purifier. The Air Oasis patent-pending nano Nickel HCT catalyst coating utilizes the power of five strong catalyst metals, as well as an advanced hydrating agent that makes the Air Oasis catalyst the most effective on the market today. Don't be fooled by competitor air purifier products using Titanium Dioxide (Ti02) alone. Redundant oxidizers reduces mold, bacteria, fungus, viruses, chemicals, VOCs, pollen, dander, odors, etc. not only in the air but on surfaces such as bathroom and kitchen countertops. UVC lamps utilize the short wavelength of UV that is harmful to forms of life at the micro-organic level. It is effective in destroying the nucleic acids in these organisms so that their DNA is disrupted by the UV radiation, which is a form of ionizing radiation. This removes their reproductive capabilities and/or kills them. This can only be achieved using a UVC or UVX lamp in the 254 nm range. Any other UV lamp air purifiers will not be effective! Gas and vapours are decomposed at a molecular level and not just partially trapped in a filter media. The UV light and ozone are not new discoveries. Ozone was first discovered in the late 1800's and used as a water purifier in Europe. UV light was discovered in the 1930's. Actually, nature discovered it before; it was called the "sun". The disinfection qualities of UV light are also not new. Hospitals have used UV light for decades in operating rooms. Barbers were disinfecting combs in the 1950's with UV light. What is new is the enhancement of both these natural, friendly oxidizers and the validation for use on air, water, food and laundry. In the mid-1980's air purifiers started to make their way into the residential market. Ozone air systems were widely used in the commercial restoration business for fire and flood damage to buildings. These applications utilized corona discharge systems (CD) that use a spark or electrically-charged plates to simulate lightning. This converted the oxygen (O2) to ozone (O3). The CD method creates very high concentrated ozone. Plus, by using air as the oxygen source, you are receiving 20% oxygen and 80% nitrogen. The problem with CD systems is with oxygen conversion you also get a nitrogen conversion, which makes nitric acid and nitric oxide along with potentially dangerous ozone levels. The problem facing the residential air systems was that the cost of an oxygen generator was so high; they went without one, leading to residential CD units that produced high concentrations of ozone plus low levels of nitric oxide and nitric acid. The maintenance was a problem due to the corrosive nature of nitric acid and the high concentration of ozone exceeding the Federal safety limits of .04 ppm. Ozone readings at the exhaust have exceeded 10 ppm in some cases, which is dangerous. Air Oasis decided to stay out of this dangerous market. In the late 1980s it was discovered that lower concentrations of ozone could have an effect on odors, mold and bacteria. Testing this theory determined that safe, low levels of ozone could have a significant result with airborne mold, odors and bacteria. The problem was to create a safe residential air purifier that could produce safe, low concentrations of ozone, but one that would not exceed the .04 ppm Federal limits. This was accomplished in the early 1990's using a photo catalytic oxidation (PCO) technology. The AHPCO Cell was developed in 2003 as an advancement to the PCO technology, which added Rhodium, Silver and other precious metals to the catalyst to improved hydration compounds. Additionally, a completely new target concept was used: A 360 degree cell to provide maximum exposure of the catalysts. The bulb was reworked and a UV Broad Spectrum bulb with a heavy-duty filament and long-life coating was developed. This gave the new AHPCO Cell an unprecedented 3 year, 25,000 hour life. This was a major improvement over the current standard 8,000-10,000 hour UV bulb life. The most important improvement was the efficacy ... the new cell design created more hydro peroxides and super oxide ions, while reducing ozone levels to .01 to .02 ppm or less. Country air, forest air, beach air and the air around waterfalls usually contains roughly .01 - .02 ppm of ozone. Most people can smell ozone at .01 ppm, and .04 ppm is the federal safety limit for residential devices. The new AHPCO cell also produces hydroxide ions and ozonide ions which broadened the scope of its air purification capabilities. In March of 2006 the Air Oasis new quad-nano Xtreme catalyst coating was introduced. With this new patented coating a fifth powerful catalyst metal was added. Air Oasis also reduced the particle size of the metals down to a nano-size particle in order to increase the surface area, thereby increasing the kinetic rate of reaction. The hydrophilic gel was also improved to further hydrate the coating and react in combination with the metal catalysts (by donating hydrogen to the ozone) to decompose ozone to form hydroxide ions, and radicals, as well as hydro-peroxides, such as the HO2 radical and hydrogen peroxides. These are desirable reactioary byproducts from the decomposition of ozone due to their strong oxidizing properties, which enhance the germicidal effect of UV radiation. While competitors are using only TiO2 (titanium dioxide) as the only catalyst and having either no hydrating agents or less effective catalyst coatings, Air Oasis is setting the standard for the next generation of air purifiers. "This picture is a great testimony to your air purifier product. I had no idea how bad my air was until I did the test...."